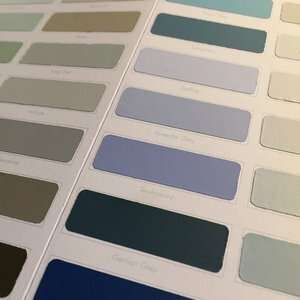 The majority of homeowners we work with like, and specify, Farrow & Ball or Fired Earth paints. We like and recommend these too, but that doesn’t stop us from seeking out new and exciting brands; so when we heard that the founder of Konig Colours was going to be at Focus/16 talking about the creation of her paint range, we hot-footed it across London to Chelsea Harbour Design Centre to see her. Vanessa Galloway has long been known as a fantastic interior designer and after years of not quite finding the right product for her projects, she decided to create her own paint range. Konig Colours ticks all the boxes you’d expect: water-based, low odour, quick drying, anti-fungal, allergy free, internal and external formulations: low sheen easy flow emulsion, flat ultra matt emulsion, Armourguard eggshell or gloss. It claims boldly to be “a new generation of eco paint”. We love the hand-painted colour chart, accurately showcasing the palette of 101 colours from fresh Astrop White to deep Lorco. You’re sold already, right? But wait – here’s the best bit…all of the paints have a high solids content which means that less coats are required than with other paints. This is good news for the decorator and good news for the homeowner with an eye on their budget or project deadline. So next time you’re perusing your usual brand’s colour chart, consider breaking free from the mainstream and choosing something different for your home. To learn Vanessa’s colour trends for 2017, read our Konig Colours Trends post.